This is one of those quick and easy weeknight meals that you can pull together in 15-20 minutes. I made these a while back when we were getting ready to move and I was trying to keep meals simple. I bought chorizo at the store not knowing what I'd do with it. When it came time to prep dinner, I spotted a package of flour tortillas in the fridge, along with some fresh spinach and cherry tomatoes, and there was my inspiration - a chorizo quesadilla with spinach, tomatoes, and Monterrey Jack cheese. Well, for me anyway! I knew Jon wouldn't like the spinach and tomatoes, so I made a different one for him. That's what I liked about this meal - I could make everyone's quesadilla specific to their tastes. You'll need 2 sauté pans to make this meal. In the first pan you'll cook your crumbled or sliced chorizo (crumbled for the little one and me, sliced for Jon). You'll also sauté your other ingredients/fillings in this pan. In the second pan you'll heat your tortilla and put the whole thing together. You can get really creative with this, using up any veggies that you may have sitting around. It's also a great way to use up leftover veggies, or leftover sausage, making it the ideal easy, weeknight meal. Heat olive oil in pan #1. Add crumbled or sliced chorizo and cook until browned. Once browned, either remove the chorizo from the pan or just push it to the side while you sauté your veggies. Heat pan #2 over medium heat. Add the tortilla and allow to warm. 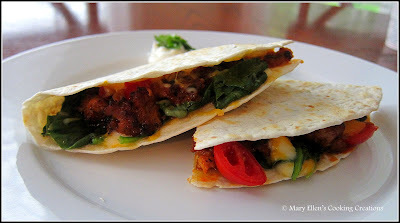 Sprinkle some cheese over half of the tortilla, add your chorizo, veggies, and top with more cheese. Fold the tortilla in half and let cook a few minutes before flipping. Cook until crispy and slightly browned.